A woman betrayed by the leader of her "assassination squad" sets out on a violent quest for revenge. See also Kill Bill: Vol. 2 (2004). 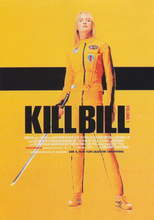 Created by Quentin Tarantino as an homage to martial-arts and "revenge" film tropes of days gone by, Kill Bill: Vol. 1 follows an unnamed woman known only as "The Bride" as she awakens from a four-year-long coma to seek revenge against Deadly Viper Assassination Squad leader Bill for betraying her and leaving her for dead years earlier.